It can be challenging enough to shape the immediate plans and needs for the project, let alone tell the future. Yet it’s understandable why a funder is concerned with what happens after their funding runs out. A grant from a funder is an investment. As investors, funders want to maximize their return on investment (ROI) by funding organizations that will deliver the greatest value in social outputs over time. The organization is committed to making this project a priority. The organization is seeking a “quick hit” of grant dollars. The organization has a plan to continue the project and meet the community’s needs beyond this grant. The organization lacks a plan to sustain the project, and community needs will be unmet. There is evidence the organization is stable will be viable into the future. The organization is not reliable or stable, so the project is bound to fail. How can organizations convey it presents a high return investment and provide a confident sustainability plan to funders? 1. Paint the big picture: It’s difficult to convince a funder a project is sustainable if they doubt the organization’s overall stability. Highlight the agency’s fiscal and organizational health. Explain progress towards ameliorating leadership pain points and fiscal woes that the funder may know of. Showcase a strategic planning process or other ways the organization is strengthening its capacity. 2. 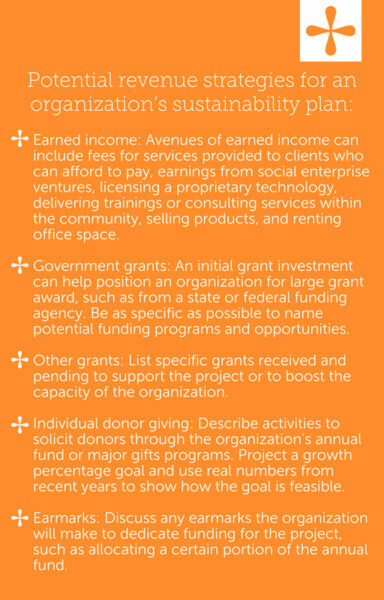 Develop a comprehensive funding plan: The sustainability section should not be something made up by the grant writer. It should reflect the real and collaborative work by the organization’s executive leaders, development staff, and board of directors to design a long-term, diversified funding strategy. If your organization doesn’t have this kind of plan, make it a priority to create one. 3. Discuss an intention to “step down” grant funding: Most funders don’t want to be on the hook to fund a project forever. Describe a plan to rely on a decreasing portion of grant support overtime by boosting support from other sources. It’s not enough to make vague reference to “increasing fundraising efforts.” Above are examples of specific revenue strategies to consider including in your organization’s sustainability plan. Investing the time and focus to build a strong sustainability plan will yield two-fold results: a stronger case to bring forward to grant funders and a detailed and ambitious strategy to ensure the long-term success of the organization and its programs. ← Hiring a grants consultant? Here’s what to look for.